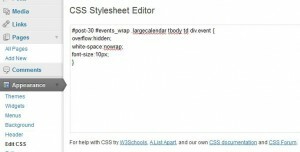 Css as it relates to creating, editing and displaying events and calendars in your wordpress website. The plugin comes with two sets of default icons (16px and 32 px). It also includes extra icons that match those for your use. You could choose just to have the link text for the actions behind the icons. See the “Listing events’ settings. First switch the default images off and then use css to show your chosen icons instead. There are various techniques that one can use to replace text with an image. The following was used to demonstrate the above replacement using the plugins html classes. See the pluggable files in each plugin folder. Use the function there as a base for your new function. Add your function to your custom themes function.php or to your own site specific snippets plugin. Events can be grouped in many ways. To set up groupings see this post on event grouping and styling. 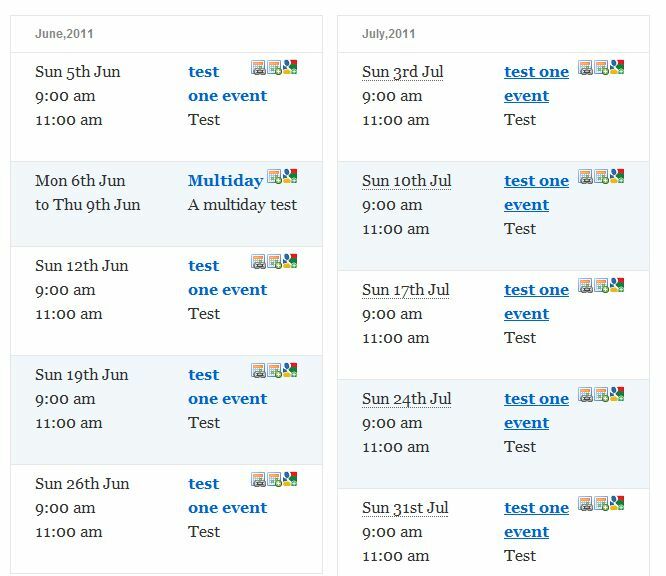 Events can be grouped by date formats or by categories, tags or custom taxonomies. Grouping also allows one to do timetables (grouped by day), weekly schedules, or monthly, quarterly or seasonal event views. 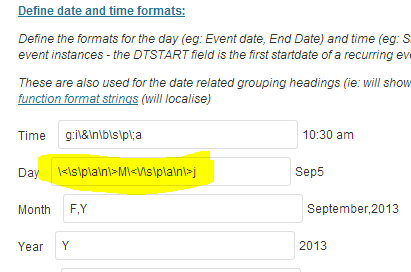 See how to format the date related groupings here. 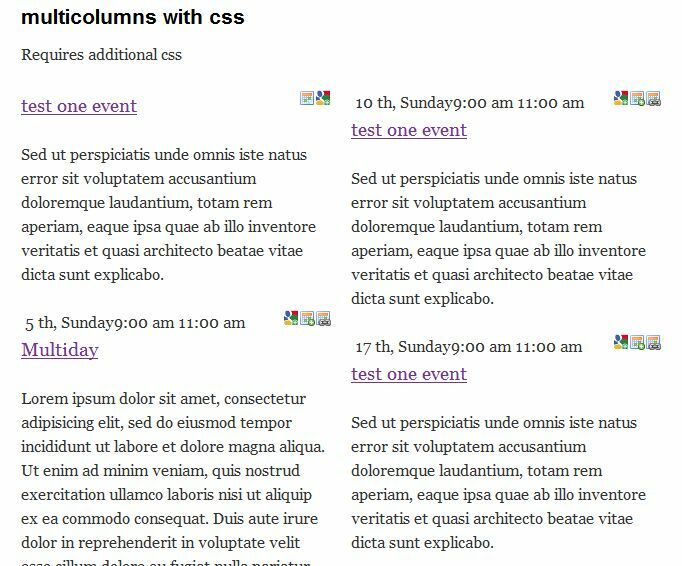 Each grouping comes with css classes so you could for example do seasonal styling of event groups. 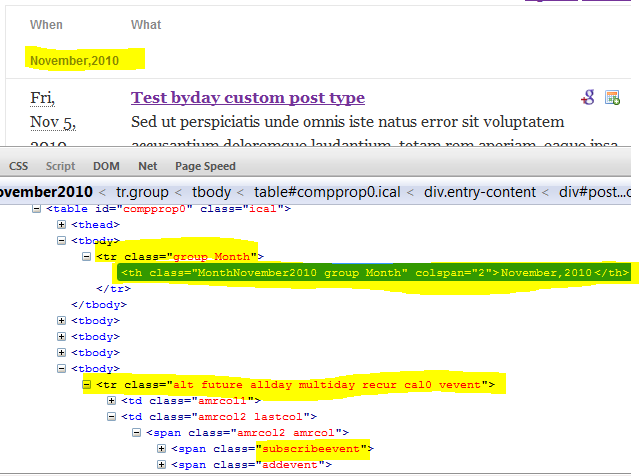 I received a question about whether the plugin could style dates in the way the little purple date is shown in the header image of the website and the plugins wordpress page. The calendars shown in the header are taken from real live examples of the plugin being used in various sites. 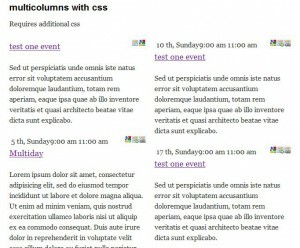 The sites will in many cases have added custom css to style the events lists to match their themes. With a combination of the date and time formats in the settings for each list and some css, almost anything is possible. The key is that one can add extra characters into the php date format string. If the characters are the same as a date format character, one can ‘escape’ them with a preceding backslash. Sooo…. 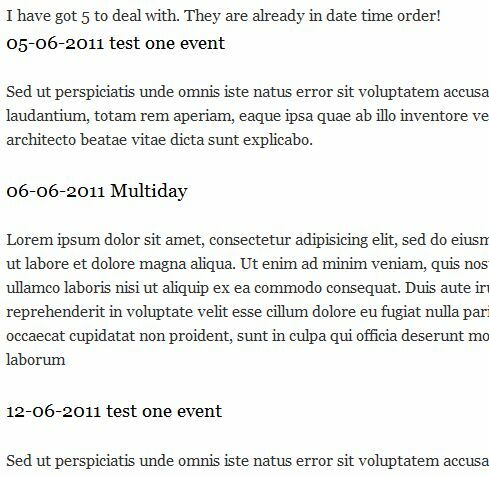 one could for example add some html to isolate part of the date for css styling purposes. The image below shows the date and time format settings for a event list. Note the format string for the day. It surrounds the month with a span. Then one can spice it up with some custom css. To prove this, I have used the power of the firebug browser add-on to add some element css to show you what could be done. I’d put the text-align: center at a higher level actually – no need to repeat it. 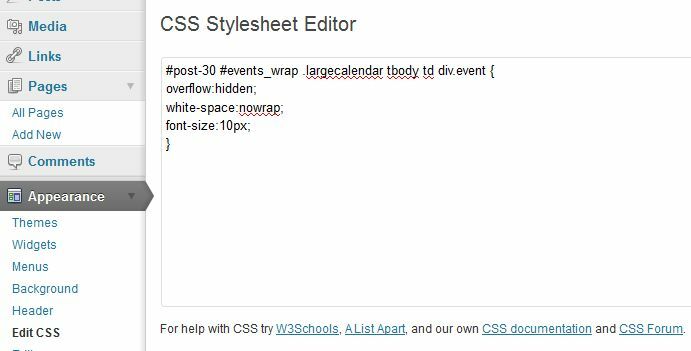 You of course would add the css for the event date class and the span within it to your theme or to a custom calendar css file. Tables are wonderful – they expand beautifully and naturally to fit your content, but sometimes that same content can make the table do weird things. Please be sure to test your css in your theme with representative content. The plugin tries to deal with some of the problems that occur. For example long urls that can make a table expand too much. See also plugin-and-theme-css-not-working-well-together. Sometimes the only way to really sort a table width out is to “fix” the width of the table and/or the table cells. Now this the plugin has to leave this to you – some people have wide content areas, some not. Some have lots of info displayed, others have minimal. The plugin has no way of knowing what size would work best for you. I suggest that you use something like firebug to see what your theme is doing (or not doing!) and then google table+css+width for ideas on what might work with your theme. 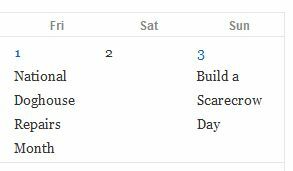 You know the size of content area that your calendar or agenda list must fit into and perhaps simply setting the width of the table and/or the table cells will be the answer. word-break: (normal, break-all, keep-all) aimed at dealing with mixed character sets. Random Break Point. See posts on this site tagged css. Update fields to show so that only Starttime and Summary have column = 1, all else =0. Add a ‘space’ either “&nbsp;” (non breaking space) or “&#32;” a normal space. If you anticipate a very large number of events per month, go to the “Define maximums” and enter a max number of events approx double what you expect. Click ‘Update’ to Save your listtype. In your largecalendar page, enter the shortcode, using your list type number. Optional: Decide whether to you want a dropdown box or not. See parameters available. The default css will allow the full event title to be displayed. If you want to trim it so the event stays on one line, you need to add some custom css. A horizontal weekly calendar is now possible (in a few hours anyway). … hmmmm we could do that. 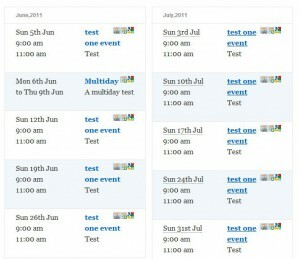 From amr-ical-events-list version 4.0.5 onwards use shortcode [weekscalendar]. You will need the new list type 11. It is not exactly the same as above. If you really want the sff.org style, only show the summary and the event date and times. Set all other columns to 0. Colour it with some category, tag or taxonomy styling. 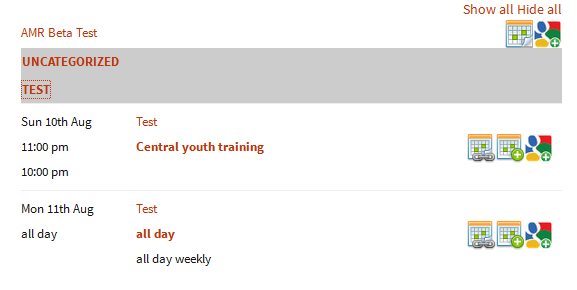 Oh, by the way, you always could do a weekly vertical agenda too, I’ve added a sample listtype for that too (no 12). I had a request recently about being able to list the events in ‘columns’. 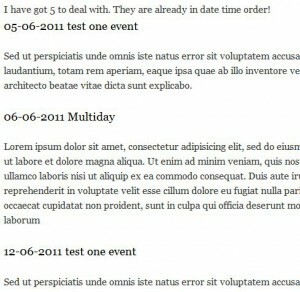 I took this to mean the css3 idea of columns, as of course in many list types, the event details are in columns. After allowing the brain to ferret away at the idea, it turns out there are a few different ways to do this with the plugin. Remove the groupings – they look weird in columns. If the grouping was days, and you removed it, you may want to add back in the EventDate field. The HTML5 style looks quite nice, as does the lists style, see widget style (listtype4) (without groupings). Only do this if your listing requirements are simple, your events similar in the fields that they have AND you know php well. You may be better off letting the plugin do the hard work and use a list type than re-inventing the wheel and trying to anticipate all the sorts of event data and conditions (all days, no end times? etc). The main part of the plugin has been around for years now and is pretty stable – why start afresh? If you still want to know how you’d do it…. Many of the plugin functions are now ‘pluggable’. Simply override the amr-list-events function. If using another plugin to do this, activate your plugin first before activating the events plugin. Your function will be passed a sorted list of events where the recurring events have already been exploded out. var_dump each event to see what fields you can use. You’ll still use the shortcodes and the parameters. Copy the code, edit for you and put in your plugins folder. Go to your calendar page to see the simple list. Note this example is just a proof of pluggable concept. I have not done the columns – all you’d require is a for loop for each ‘half’ of events and a floated div for each loop. 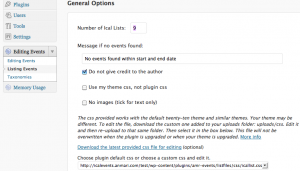 Description: test the amr-events and amr-ical-events-list pluggable functions. Finally someone wants to use the category to style their events. Yeah!! As of the latest version you can do this with your remote ics file (free version) too if the ics file has categories. 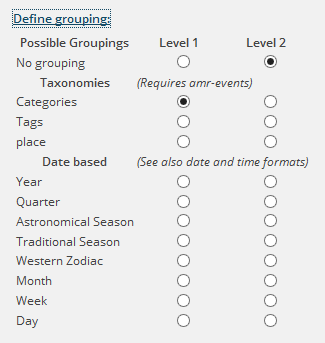 If using amr-events, taxonomies and tags can be used to. The other classes indicate that it is an event (not a task or note), it is in the future (not past, or today), and that it recurs. where t## is your termid or category id. It may be safe to use id’s, in case you decided to change the category name and slug and forget that it will mess up your css. The id will still work. check what selectors will work you and for your chosen listtype. Check whether you need to override your theme’s ‘active’, ‘hover’, ‘visited’ states too as per the mandarin line above. See “Listing Events” / “General Options”. Option: Do not generate any css, use theme css only. Option: Create a custom css file for the plugin. Copy/Download the defaut css style in your websites upload folder. (Do not edit the css file in the plugin directory as it will be overwritten when the plugin is upgraded). 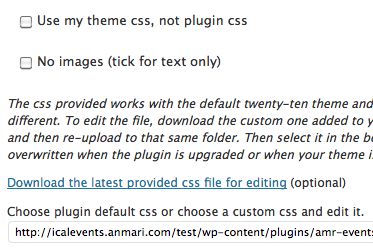 Tailor it to suit your theme, then put it back in the uploads/css folder. Return to the “listing Events” settings and choose the custom file from the list of files in dropdown list in the main. Update. The plugin will then add that css file into the website’s css which ever theme you are using.